Do you ever wonder, “Whom am I?, What is my purpose? How does my life matter? How can I make a bigger difference in the world?” Or maybe you wonder, “How should I spend my time? What is school for me? Or There is so much to be done, I don’t know where to start?” Come as we discover together how God and God’s people can guide us toward what God is calling for us to become. The Rev. Dr. Lee Hinson-Hasty is, at heart, a sailor who knows how to catch the wind of the Spirit and teach others to do the same. He has served as a pastor, a campus minister, as Montreat Youth small group leader and planning team member, and on the General Assembly staff for over a decade. Take a look at this Vocation 101 video to begin thinking about this conversation and learning opportunity. 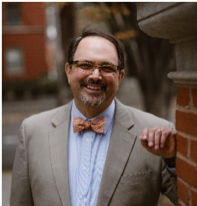 Lee Hinson-Hasty is senior director for Theological Education Funds Development for the Presbyterian Church (USA) and the Presbyterian Foundation, in support of future ministers and our PC(USA) Seminaries. Lee has served as a campus minister, pastor, and college administrator in Virginia and North Carolina. Lee is active in the theological academy especially in leadership development. Lee is a graduate of Wake Forest University, Louisville Seminary, and McCormick Theological Seminary. He is married to the Rev. Dr. Elizabeth Hinson-Hasty, and they are the parents of Garrison (18) and Emmeline (12).